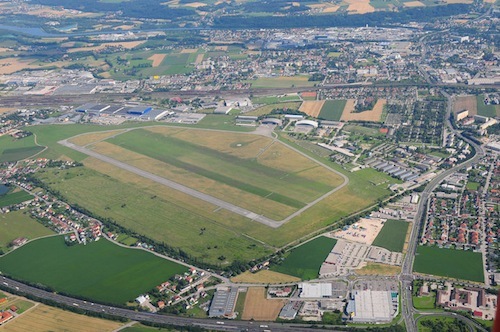 (PPÖ/Wels) – The regional aerodrome in Wels, Austria, saw an historic event earlier this month: more than thirty Caravelles and Explorers, known as CaEx, aged 13-16 from the Upper Austria region of Pfadfinder und Pfadfinderinnen Österreichs (PPÖ, the National Scout Organisation in Austria) took part in the first Air Scout Camp to be held in the country in more than sixty years. 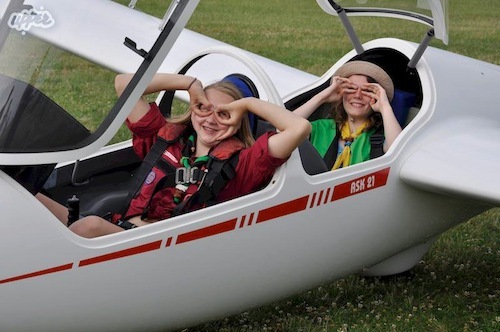 Many more than the thirty-odd participating Scouts and Guides would have pitched their tents just next to the runway for this unique experience but due to recent disastrous floods effecting the region, a number of local Scout Groups were in fact offering their services to communities requiring help in clear-up operations. “Many of us share mankind’s dream that once made Ikaros construct some wings to take off and fly like a bird and admire the landscape from a bird’s eye view” Chris recalled as some of the reasons which had motivated him and his team to plan and run BELT-UP, “And the history of Air Scouting goes back to the early days of Scouting itself. 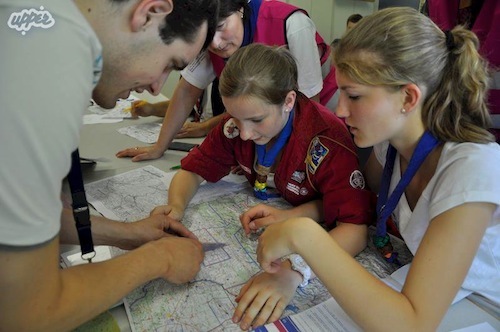 This was followed on the second day with initiation to basic aerial navigation principles: “This was not so difficult”, recalls Birgit Wögerer, one of the participating Scouts from Freistadt, “most of us had already acquired useful skills in Scouting when we prepared hikes and other expeditions, although the scales and potential obstacles are different. And of course there is not just ahead and back and left and right but also above and below!” This part also including properly planning and plotting the participants’ own flight plans. 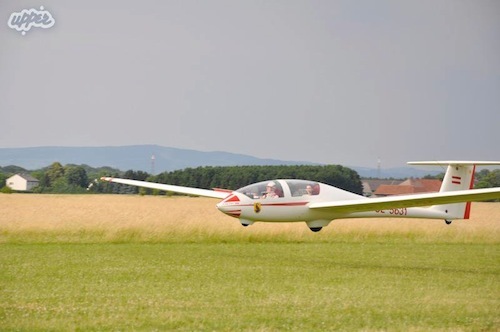 With all these preparatory work done, the moment came for which an excited group of Scouts and Guides had been waiting for: the first of a series of flights in a two- or four-seats sports plane with qualified pilots from the hosting Weisse Möwe Wels Flyers Club in command and control. And so a memorable day continued. With more experience gained after several flights, the Scouts were allowed to take over the controls and actually fly the aircraft. And not just in motorised planes. Some experienced flying gliders with just the pilot’s skills and the wind keeping the aircraft in the sky and bringing it back down safely. Yet others tried their skills at power kiting. And when not up in the air, the Scouts and Guides discovered that the airfield was a small nature wildlife haven for certain flowers, plants and animals only to be found in that particular environment. Day three of the Air Scout Camp began with another series of skill sessions on subjects like meteorology, the use of the phonetic alphabet in radio communications, aircraft marshalling and signalling, and on how aircraft engines work. In the evening, the Scouts, Guides and their Leaders entertained their new friends from Weisse Möwe at a typical campfire and barbecue and thanked them for having made this event such a success. At the end of the weekend each participant received a certificate and was awarded a special “Young Aviator” pilot’s Scout badge. And many have indicated that they would not hesitate in encouraging their friends and others to attend the next Air Scout Camp in 2014!